What an evening! Those that attended on Friday 22nd March to come together and celebrate our international links had a brilliant time. The savoury food that everyone generously contributed looked, smelt and tasted amazing! There really wasn’t much left at all before the entertainment began! The cake and dessert table was equally wonderful and extremely tempting. I opened up the proceedings for the evening and welcomed Cllr Johar Khan and thanked him for the generous £500 donation from the Councillors and Community Ward Funding Team at Waltham Forest Council. Ella Faulkner shared with everyone the money raised so far by the Friends of South Grove and the excellent work that they had done in the last 3 years to support the school working with Brigid Montgomery. 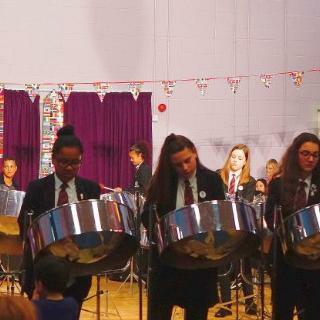 The evening was opened by the fantastic Steel Pans from George Mitchell School. They were absolutely amazing and really started the evening off well. They were followed by the Irish Dance Club with children as young as Year 1 who blew our minds with their light footed dancing! The drama club re-enacted a Dr Suess book called Greens Egg & Ham. They had amazing memories for not only the words but using their props at the right time! We then listened to the beautiful sound of the traditional African instrument the Kora, played by the world famous Mosi Conde followed by a very energetic Dance Club performance and some rousing songs by the choir accompanied by Drum Club. The L.E.A.D.E.R.S Community Theatre performed their street dance which was very professional and confidently done. Well done to them. Our Kung Fu Club performed their moves that they have learned during their lessons. They were extremely controlled and disciplined in their actions, clearly enjoying what they have learnt. The Bulgarian Folklore Dance Club in their beautiful traditional costumes finalised the performances for the evening. They were stunning to watch with all their brightly coloured clothes. The raffle finalised the evening with many of our children winning the prizes which seemed really fitting! those staff who stayed and supported. It really was an amazing evening!